Harmony is when things fit together. In music, harmony occurs when two notes are sung together and they create a more beautiful sound. In art, a masterful painting has the perfect combination of color and line. The colors of a Monet painting compliment one another and form beautiful images of lilies and peaceful lakes. The great mathematicians speak of the harmony of a proof. When all of the pieces of a complex mathematical formula work together, they create a harmony leading to new knowledge and understanding. Harmony is not reserved for musicians, painters or mathematicians. We all experience moments of being in harmony with our surroundings. At these times, we feel that we fit in perfectly where we are, that we are a natural piece of the puzzle. For me, one place to find harmony is by fly fishing the cold water trout streams. 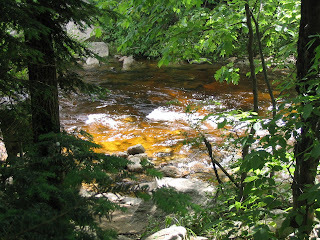 One river that I often fish, the Connectquot, is located in a nature preserve. Since the river sees many fly fishers, the wildlife is accustomed to human beings. When walking back from the stream at sunset, I sometimes see a small herd of deer among the trees. I stop walking. They stare at me. I look at them. There is a moment of silence. And I feel the harmony, when two of God’s creatures, a human and a deer, can spend a moment together in peace. When in the stream, I also feel harmony with nature. Of course, I know that the trout and I do not have such a peaceful relationship. I’m either catching and releasing them or getting frustrated that they will not take my fly. But when I am waist deep in cold water, and I am tying a new fly on my line, and I am not moving, and I am not talking, and all I hear are the sounds of the bugs and the flowing river, then I feel at peace with all that is around me. Picture: A peaceful place on the Battenkill River in Vermont. Sometimes a family of ducks swims by, first the mother, then 5 or 6 young ones with their fluffy baby feathers. I stop what I am doing, I watch them, and they swim by going about their business. I crave these moments of harmony, when I feel like a natural part of the world, when I fit in with the river, the deer and the ducks. In Hebrew, the language of the Bible and the Jewish people, you greet someone by saying "shalom." The word has many meanings. Shalom means “hello” and “goodbye.” Shalom means “peace” so that when two countries cease fighting, they have reached a state of shalom. The root meaning of shalom is wholeness or completeness. When we are in harmony with our surroundings, we feel whole and we find shalom, peace. In Judaism, a family strives for shalom bayit, which means a peaceful home. When the members of a family live in harmony, working together to compromise, listen, and care for one another, they create a peaceful home. The Bible says that we all can be rodfei shalom, seekers of peace. That means that we must strive to end conflict and war. But the phrase also has a spiritual meaning; we all seek harmony and wholeness in our lives. I find that sense of shalom, of peace, when fishing on a beautiful river. And sometimes I think to say shalom to the passing ducks or deer, but I’m not sure how well they know Hebrew. Feelings of harmony are hard to find and they are fleeting. On my drive home from the trout stream to New York City, my feelings of peace are easily challenged. The sound of two honking car horns is not very harmonious. But when I return home, I try to store away those feelings of shalom, of peace. Then when I close my eyes, and I think of the ducks, and the trout and the trees, I remember the harmony I felt on the stream. And it carries and sustains me for many days. Really beautiful message and great interpretation of harmony, an ideal that is universal in its appeal and certainly worth the effort to achieve. 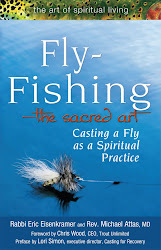 From the Renaissance to flyfishing, harmony can be powerful, yet sometimes delicate and impermanent. All the more reasonv to recognize its beauty and value when it happens!